Imp stools are short mushrooms with rounded yellow caps. They are infrequently found in caves around Skyrim, as well as across Tamriel in the shade of trees or rocks. 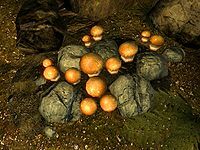 Ink-Cap Mushrooms thrive on decaying swamp life in the Bitter Coast Region of Vvardenfell, and can be found growing on rocks, trees, and even Shroom Beetles. 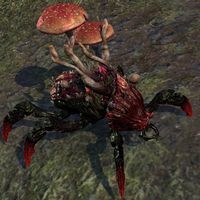 Ironstalk Mushrooms are transient fungi that were brought to the Clockwork City by outsiders. They had adapted to the realm's synthetic and inhospitable metallic soil and can be found in the Everwound Wellspring and the Halls of Regulation. If the mushrooms undergo an extensive pickling process, they can be made edible. 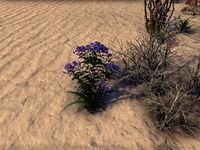 A low-lying plant with purple flowers whose fibers can be spun into thread and used to make Ironthread clothing. Ironwood trees grow deep in the forests of Skyrim and in some locations around Cyrodiil. 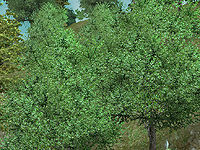 The fully matured trees produce a hard nut, favored by adventurers.